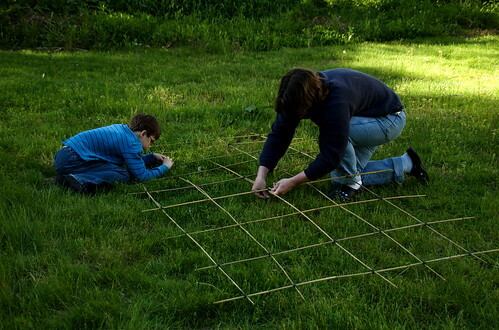 When the kids got home from school yesterday, Tomas recruited them to help him make an arched trellis for their peas to grow up and over. They wove long bamboo sticks over-under, over-under, measured to make sure they had the correct width to run the whole length of our raised beds, and tied where the sticks crossed to make it extra strong. By dinner-time, the two walls were built and standing. 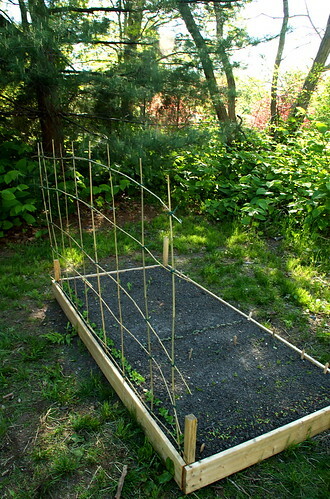 They have sticks soaking overnight to make them flexible enough to make an arch to connect the two beds, but honestly, I think it looks great already, and can’t wait to watch our peas wind their way up. It’s funny to me how slow the process of growing a vegetable garden can be, but it is oh so rewarding to see the new seedlings pop up just when you’d decided the seeds were probably duds (maybe I’m a pessimist that way). So far, we have the peas, loads of salad greens, spinach, broccoli, corn, cucumber, carrots, peppers and sunflowers all just starting to peek out from the soil. My tomatoes, lavender and zucchini are still indoors building strength, and I’m thinking next year I might just buy the tomatoes and lavender already started at the garden center, the seedlings just look too fragile to make it. I’ll be crossing fingers they do.